Why Were The Pyramids Build? - Who Built The Pyramids? Home History & Politics Why Were The Pyramids Built? More than any other artifact, the great pyramids of Egypt tell the story of one of the most extraordinary civilizations to have flourished in human history. Seemingly indestructible, brilliant and massive, they were known to the ancients as one of the Seven Wonders of the World, and are still known as such to this day. The pyramids were built as tombs for the supreme pharaohs of the Old Kingdom, while serving as a manifesto of their power as living leaders. Commissioning a pyramid was a pharaoh’s way of planning for his death. It contained all the things he would need to make a smooth transition to the afterlife. The oldest-known pyramid was commissioned by the first pharaoh of the Memphis period in celebration of the newly-consolidated early Egyptian state. In 3000 BCE, Upper and Lower Egypt joined to form a single polity with Memphis as its capital. It was the world’s first organized society. A nation of skilled builders and agriculturalists, the new civilization depended heavily on the fresh waters of the Nile River. It was the main source of life-giving water running through the dry northern reaches of the African continent. In the beginning, the Nile was deep and generous. Each year the river would flood, providing natural irrigation for grain harvests throughout the valley. This pivotal ecological event meant that the people, descendants of desert pastoralists, could survive and thrive as farmers in a desert hostile to most living things. In this context, the pharaoh played a vital role. The authority of an Egyptian king rested on his inside connections with the gods. He was the most important person in society because he could ensure the flooding of the great river. For 1,000 years, bountiful Nile waters and this myth of leadership prevailed. Many pharaohs of the Old Kingdom chose to celebrate their success with large-scale public monuments, wonders of architecture that showed off their mighty and prosperous civilization to the world. 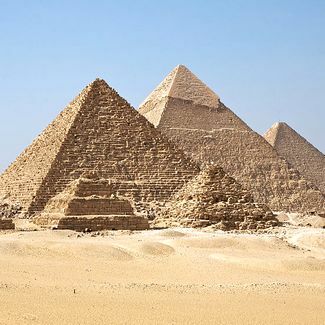 These were the first pyramids. The thrusting shape of the pyramid symbolized the rising of land and new life. This metaphor, called ‘Benben,’ was key to the spiritual aesthetic of Egyptian culture. It mirrored the seasonal emergence of fertile soils, flora and fauna as the spring floods of the Nile receded each year. The people of Egypt strongly associated the pyramidal shape with life and renewal. Although fertile land inspired their contours, it was the divine sun that infused the pyramids with meaning. The traditional pyramids of Giza had flat faces of white sandstone. The stone casing attracted the sun’s rays, much like a solar panel. Although their shimmer has faded, it is believed that the pyramids once glowed in the morning sunshine. These special effects drew attention to the all-sustaining warmth and light of the sun-god, the chief deity of the universe—Re. Egyptian pharaohs were considered the sons of Re. 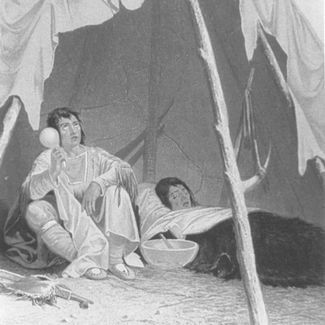 It was commonly believed that the sun’s cycles depended on the cycles of their dynastic leadership. For the king, death was just the beginning. A living pharaoh was the incarnation of Horus, the god of the sky that contained both sun and moon. It was Horus that raised the sun each day. When a pharaoh died, though, he became Osirus, and the role of Horus passed to his living son, next in line to be pharaoh. Osiris assured the setting of the sun. Entombing the king’s body inside a pyramid thus ensured the rising and setting of the sun would continue undisturbed. What’s the Difference Between Fruits and Vegetables? What is the Illuminati? What Are The Health Benefits of Pistachios? Is My Child Ready for a Puppy? Why Haven’t Any Animals Evolved Wheels? What are Chakras? Is Horse Riding a Good Way to Boost Fitness Levels? What's The Most Dangerous City In The World in 2014?